Do you want to differentiate yourself from your peers at work? I have a simple suggestion: speak up! That's right. It's time to work on your public speaking skills. Of course, I understand that speaking in front of an audience is something that frightens many people. But learning to speak well in front of an audience can have positive impacts on your career and job search. 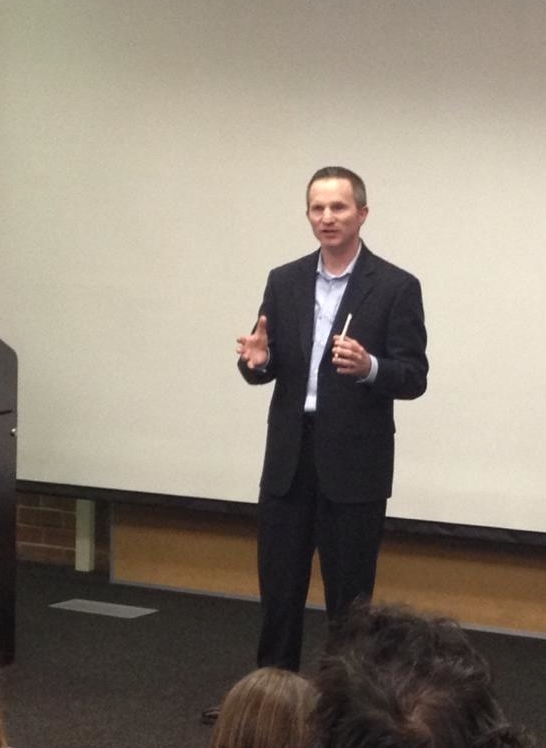 In my experience, public speaking is one of the greatest career differentiators. Regardless of where you work, in a restaurant, an office, a warehouse or on a construction site, you can stand out from your peers by public speaking. Learning to speak well in front of an audience can get you noticed more and make you more approachable. And, becoming more comfortable speaking in front of a crowd will help you perform better in an interview. I learned the importance of public speaking years ago. While working at Providian, there were many times when supervisors and managers were given an opportunity to present to our executives. I was petrified with fear of the thought of speaking in front of our leaders. Some of my colleagues, however, jumped at the chance to do it. I was determined to get over that fear, and I did. If you are afraid of speaking in front of an audience, here are some tips to help you. Say yes. Just do it. Some times the hardest part is just saying yes. The next time your boss asks you if you want to lead a meeting, or make a presentation, say yes! Start with a script. Write out what you're going to say. Yes, I mean every word. You're not going to read it when you present it, but it will be helpful to get your language and timing down on paper. Practice, practice, practice. I like to practice in front of a full-length mirror, or just wandering around my bedroom. Get a full night's sleep the night before. The older I get the more I realize how important it is to get a full night's sleep before doing something that makes me nervous, especially if it's for the first time. Don't change up your routine the day of your presentation. Wear clothes that you like and that you're used to wearing. Don't eat new food. Speak louder than you think. One of the most common mistakes made by speakers is that they speak too quietly. You will not be memorable if your audience can't hear you. Occasionally modulating the volume or pitch of your voice is effective way to be engaging, but start off louder than you think. If a microphone is available, use it! Too many people (almost always men) approach speaking with a mic and say "I don't need a microphone, everyone can hear me, right?". This is a sign of a weak speaker. When there is a microphone and you don't use it, there are people in the audience that won't hear you and will quickly tune you out. You are not more important than the audience. If there is microphone, use it! Don't worry about being too loud. I have never heard someone speak too loudly when speaking in front of an audience. If it's a hand-held microphone, hold it closer than you think you naturally should, but don't swallow it. If it's a lapel mic - the kind that clips on your shirt or jacket - resist craning your neck to speak to your mic. A lapel mic is designed to capture your sound when you are speaking naturally. Speak to your audience, not your mic. Move away from the podium. If there's a podium, don't use it. Don't stand behind it. Don't lean on it from the side. And move around. You will be far more engaging if you move around. Use hand gestures - which is why I prefer a lapel microphone. Think of the "box" your torso makes - with your shoulders and hips. In most settings I tend to have far more "in the box" than "out of the box" hand gestures. Boring speakers use very few hand gestures. No need to go crazy. Start by keeping your gestures "in the box" and see what feels right for the environment and the audience. Make eye contact with your audience. If this doesn't come naturally to you, try faking it. You can do that by looking for someone who is not looking directly at you and just look just above their eyes - aim at their forehead. When that person looks at you, move your gaze to some other forehead. Over time, you'll find that it becomes easier to make eye contact. Say "thank you". After you're done presenting, people will compliment you. Just say, "thank you". I've seen too many people, clearly relieved it is over and wrapped up in the post-game that they spend several minutes telling the other person how they almost threw up in the restroom, and how they thought they did terrible, and they never get around to thanking the person for the compliment. Plan ahead. Smile, and say, "thank you". Bonus - if you are speaking with a co-presenter, it's a good idea to discuss, in advance, what you will be wearing. Dressing in the same color shirt can be fun but it can be a little distracting from your presentation. Thankfully, at least, we both look good in blue :-). After saying yes to a few opportunities at work (my favorite was emceeing a company talent show) I was eventually asked to emcee the Stockton Earth Day Festival. I was nervous, but I said yes anyway and had a wonderful time doing that for four years. Since then, I have emceed a number of events for non-profit organizations I believe in. Every job requires communication, and public speaking can help you learn to communicate more effectively. Find an opportunity to speak to an audience and you may just find it does great things for your career. Do you have tips for great public speaking? Post a comment. I'd love to read them.